Every day, Charles Gladden wakes up and goes to work at the US Capitol. As a cook and cleaner at the Senate, Charles serves some of the wealthiest and most powerful people in our nation. But every night, Charles goes to sleep outside a metro station just a few blocks from the White House. Even though Charles worked full-time, he was homeless. Charles is just one of millions of low-wage federal contract workers who earn so little that they cannot live in dignity. In fact, the U.S. Government is America’s leading low-wage job creator, using our tax dollars to fund more poverty jobs than Wal-Mart and McDonalds combined. This means that we the people – as taxpayers and citizens – are complicit in creating an economy that keeps Charles and other workers struggling to survive. But it also means that we have the power to stand-up and transform a broken system. Charles is already taking action alongside other low-wage federal contract workers. Over the past four years, thousands of these workers – supported by Sr. Simone and other faith leaders – walked off their jobs 20 times to help 20 million contract workers win higher wages, protection against wage theft and other labor abuses, and paid leave benefits through Presidential action. However, these gains are now at risk of being lost. Like our Latino and Muslim brothers and sisters, the rights of workers are under attack. 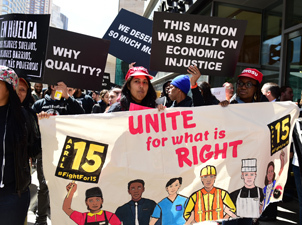 Catholic social teaching calls us to stand in solidarity with workers to transform unjust political and economic systems that put people last. We are called to defend the right of workers who are organizing to create a better life for themselves and their families. We are called to safeguard the right of workers to enjoy the fruits of their labor. And, importantly, we are called to unite with workers like Charles to hold our elected officials accountable to end our government-sponsored low-wage economy. Joseph Geevarghese is the Director of Good Jobs Nation, an organization of low-wage federal contractors organizing for living wages and union rights. Read more at: http://goodjobsnation.org. View the full Catholic Social Justice Reflection guide here. View the Lent Calendar to take action on healthcare here. This entry was posted in Front Page, Income, Spirit Filled Network on April 4, 2017 by networklobby.